It took a while to get started but in the end today’s landing earned an enthusiastic round of applause at dinner tonight. 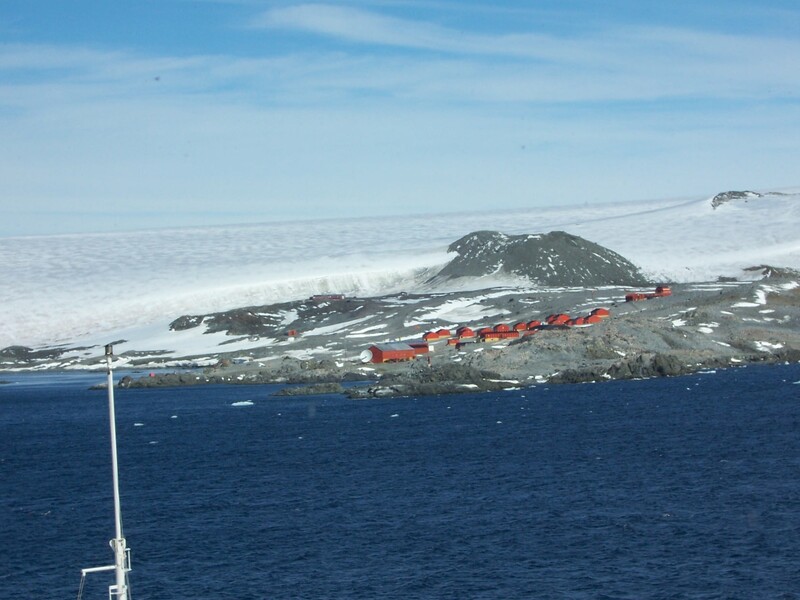 Multi-year pack ice and numerous bergs slowed our approach so after lunch we landed simultaneously at two sites on either side of Argentina’s Esperanza Station. 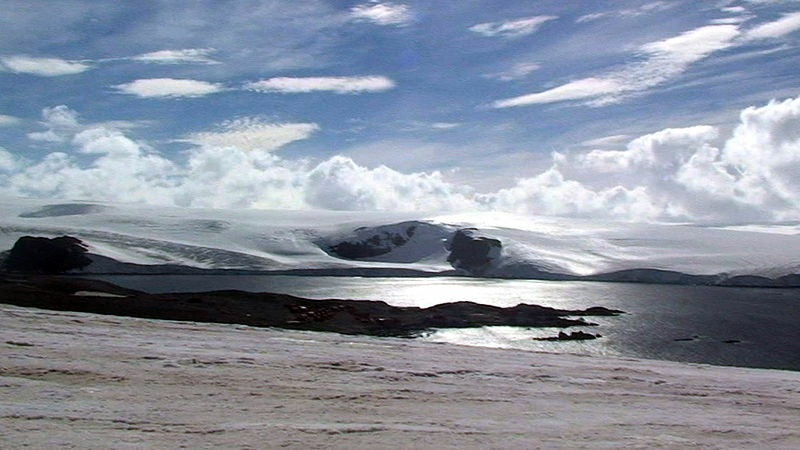 To the left (west) were outcrops the geologists wanted to see, and around the point to the right (east) was a huge Adélie Penguin colony. An unseasonal blanket of snow had transformed a normally sloppy, messy Adélie Penguin colony into a wonderland of movement and contrast. Adélies are surprisingly agile and trot very fast on snow. From a distance the lines of penguins to-ing and fro-ing along the shore look like they are skating, or on conveyor belts. We were wowed as we approached the beach and it just got better. The thick snowbank overhanging the beach made a bit of a challenge for penguins and humans alike. There were only a couple spots where penguins could climb up from the beach, so streams of them were traveling along the snowbank edge to their turnoffs. For humans on the beach they were right at eye level. This made for amazing photography and just plain fabulous penguin watching. All over the rolling slopes of glacial till and outcrops, lines and gaggles and hordes of penguins were commuting between nest and ocean. The Adélies are quite tolerant of humans and kept trotting right around us as we picked our pathways at the edge of the colony. Snow flurries most of the day accentuated the very Antarctic feel of this penguin city. Things got interesting as the tide came up under the snow overhang: the beach disappeared. The last Zodiacs were loading to return to the ship when a big crowd of Adélies piled up at the snow rim in a classic scene where none wants to jump into the water first. Finally one does and starts a cavalcade of plunging penguins. It was hilarious and amazing. Group after group of Adélies arrived at the edge and went through the same routine. Ever more penguins were also coming in to shore from a day at sea. Whole schools of them came splashing toward the beach, porpoising and zipping around underwater in the shallows until they felt ready to try a leap onto the snowbank. The birds shoot up vertically out of the water like tiny rockets but most of them bounced off ignominiously. 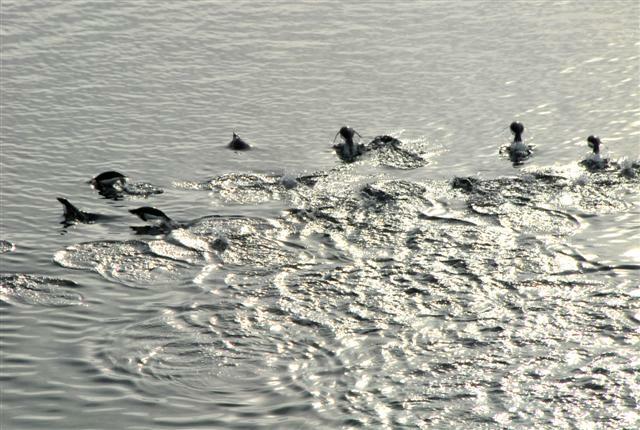 The action was just getting really good with the incoming evening wave of returnees when we had to head to the ship. Staff member Michael Moore had a GoPro camera on a stick and I borrowed an waterproof point & shoot camera, and both of us in chest waders were able to get video of penguins swimming underwater. 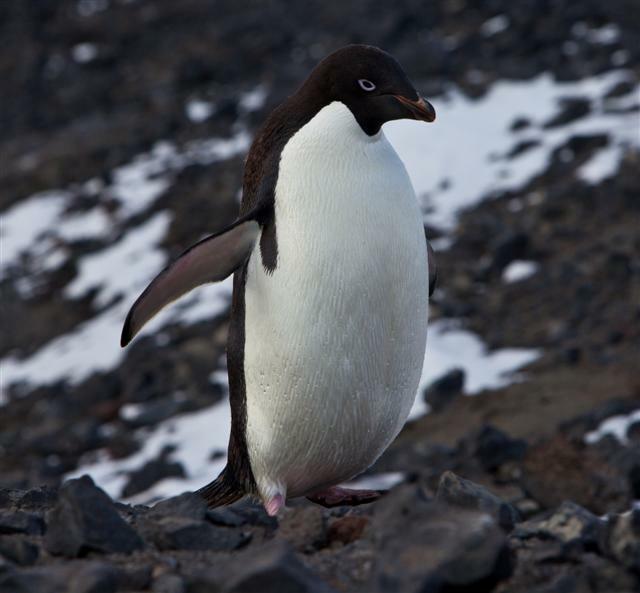 Adelie penguins swim along the surface of the water by porpoising. The show wasn’t over after the landing, though, because the incoming tide had brought in thick pack ice and the wind had died. Watching the ship carefully navigate through the ice with gorgeous mountains and snowfields all around was incredibly lovely. As Ted put it, “It’s Antarctica in all its epic, majestic beauty.” Indeed it was, capped off by a pair of humpback whales just outside the dining room widows, and a long, gorgeous sunset.